Vinyl Strap by the Foot Vinyl Strap by the Foot is available in 1.5" and 2" widths only. Casual furniture OEMs and refinishers worldwide have used our vinyl strap since 1986. We sell vinyl as straps pre-cut to size, by the foot, by the roll or by the pallet. Vinyl strap applications include patio furniture, patio chairs and outdoor furniture. 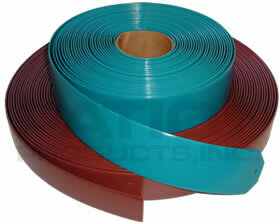 We stock 48 colors and 6 different sizes of vinyl strapping. Our vinyl, extruded for outdoor use, is commercial quality 100% virgin vinyl strap with ultra violet inhibitors manufactured into the product. Many attachments are available. The Grommets, E-clips, S-clips and C-clips may need to be installed on the strap by us. Before you order: you may visit the area to read how to correctly measure. See cleaning instructions here. Warranty.